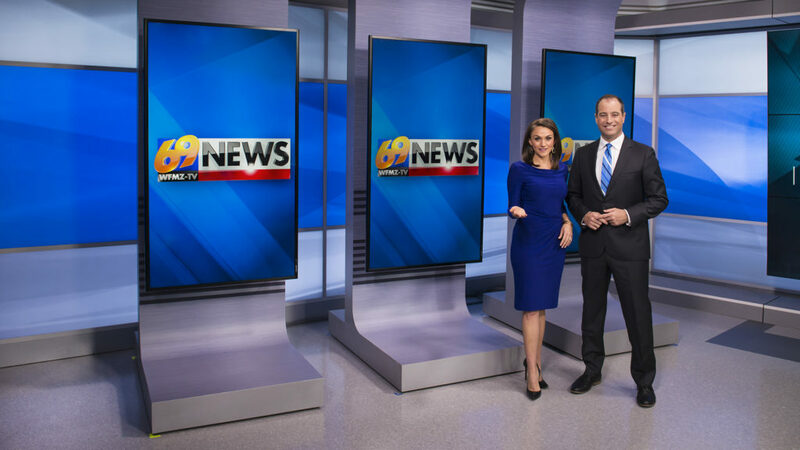 WFMZ, an independent television station in Allentown, Pennsylvania, has unveiled a new home from Devlin Design Group that focuses on clean lines accented with distinct angles and curves. “There was only one scenic partner we considered for this project, and it wasn’t just because they did our last major set ten years ago. 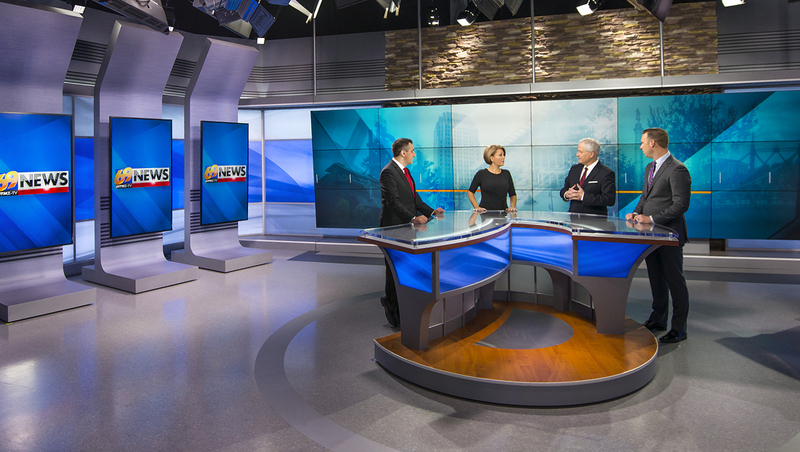 We knew at once the design would give us the production values and branding message that we needed to move our station forward to serve our viewers with the best newscast possible.” said Barry Fisher, the station’s president and general manager, in a statement. 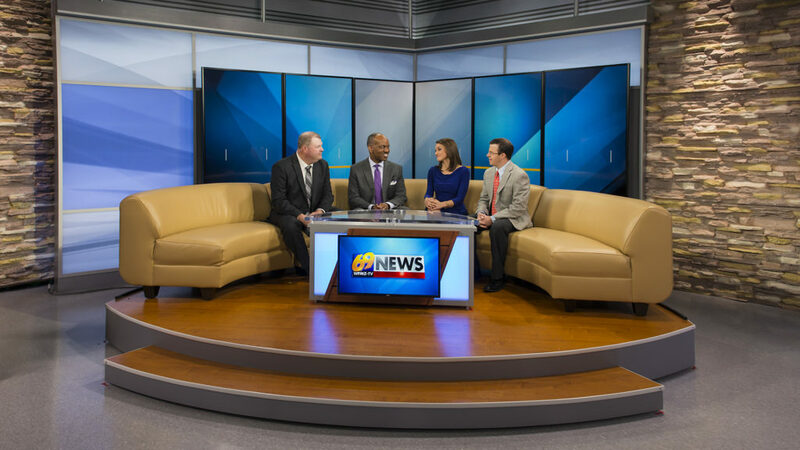 WFMZ worked with Devlin on its previous set investment, which it used for a decade. Advances in video display technology for on-camera storytelling was a leading force behind getting a new set — and the new look is based around large 6×3 video wall camera center. The main anchor desk and video wall. Photos by Dak Dillon. 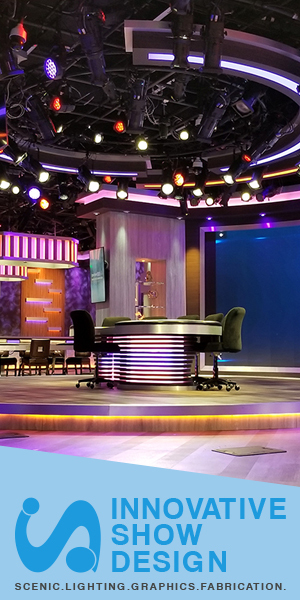 The left side of the studio features a trio of vertically mounted video panels on custom built piers that flair out at the base and angle outward near the top, subtly mirroring the angled design of the desk. The vertical monitor stands are movable, giving the station the option to use all or some of them in a variety of configurations, while the video displays also rotate 90 degrees for a variety of options. Wrapping around both the video wall and the camera left area is a backlit color changing wall with a blend of horizontal banding and subtle, curved arcs. Above this, a gray header with strong horizontal grill-like banding is bisected by a stacked stone segment that adds texture and warmth to the look while mirroring, in a more abstract way, the thick lines on the rest of the header. To the right of home base, meanwhile, is the station’s weather center, featuring an OTS monitor mounted on two smaller scales version of the piers on the left side of the space. Three additional video panels are mounted in front of a row of windows looking into the working weather office behind. The glass here is frosted with a design featuring thick lines that weave around the glass panels in a pattern reminiscent of a circuit board or road map — and that also echo the horizontal, vertical and angled elements found elsewhere on the set. Above and below the windows are a header and knee wall that mimic the look of the gray headers found elsewhere on the set. The new studio space also includes a multipurpose area that uses the stonework found in the center header on a larger scale on either side of the backlit panels that intersect in the corner of the space, while six vertically mounted video monitors follow the path of the walls. 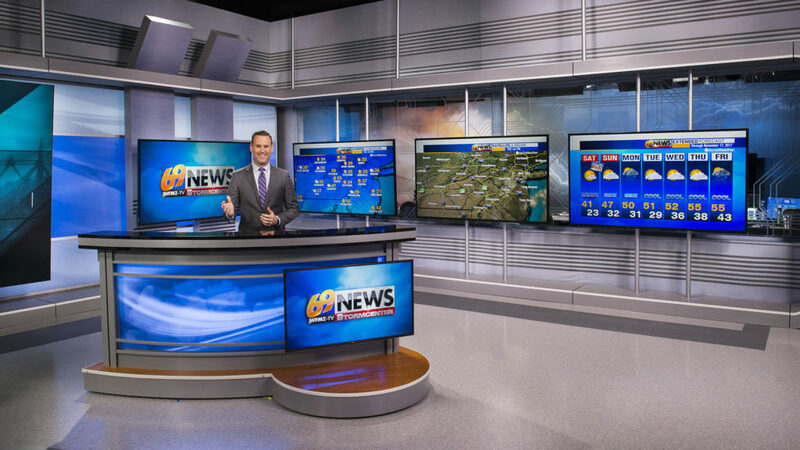 Thanks to cable coverage, WFMZ’s programming reaches segments of the Philadelphia, New York City and Scranton/Wilkes-Barre markets, putting the station in the unique position of having to compete against a wide range of media outlets. 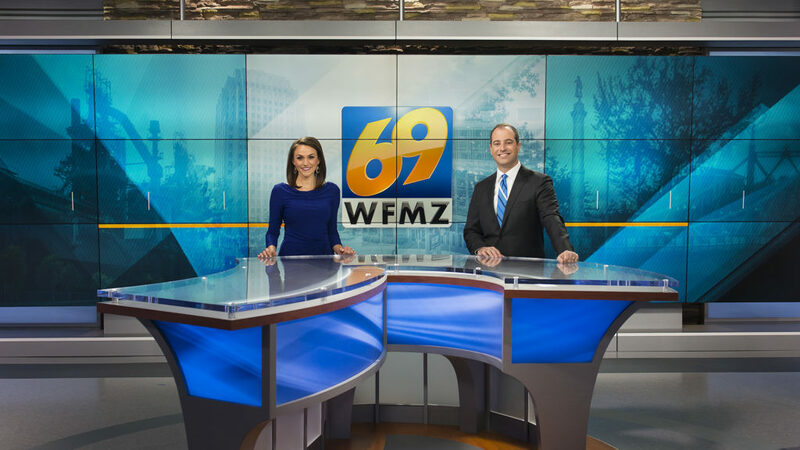 “Being from the region, I know that WFMZ is plucky, and deserved a set that captured their independent spirit,” said Dan Devlin, owner and chief creative strategist of Devlin Design Group.